Louise loves baking with rhubarb, but she knows I’m not a fan and offered to write a guest post for her fellow rhubarb lovers. Since I couldn’t decide what to bake this weekend, I took her up on the offer and am now happy to share this recipe Louise put together last week. The streusel topping is from an Epicurious pie, and Louise likes it so much she uses it on lots of things. She also makes it with cold butter rather than melted and cooled. You might get a lumpier, less coarse streusel by using melted and cooled butter and rubbing it in with your fingers as directed, but Louise saves some dish washing by making the streusel in the food processor bowl and cutting in the cold butter. I’m not sure there is really a “better” way to do streusel – is melted butter melted than cold? Maybe it just depends on how big you want the lumps. Either way seems fine. As for the filling, it’s pretty much a standard rhubarb pie filling. In this case, it’s similar to one from Farm Journal’s Country Cookbook, 1959. Those are all the sources, but at this point I think it’s fair to call it Louise’s since she put it all together. Reading through Louise’s recipe late yesterday afternoon, I was inspired to try it myself, but with an apple filling instead of rhubarb. I loved the crust, loved the topping, and recommend both. As for the filling, you’ll have to decide for yourself which one to use. I put the apple filling recipe at the bottom. 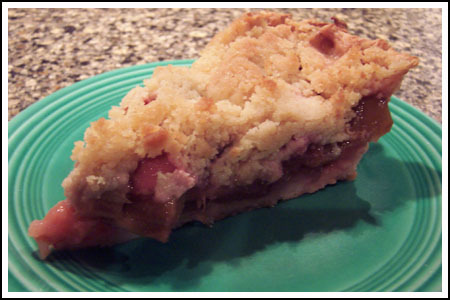 For this pie you can use the rhubarb filling or apple. Crust: Mix the flour, sugar and salt together in the food processor. Add chunks of cream cheese and process until the texture is coarse and slightly lumpy. Add the chunks of frozen butter and pulse until coarse with some pea-size lumps. Remove top of food processor and sprinkle in 2 tablespoons cream. Pulse until mixed. Reach in and pinch dough. If it doesn’t come together, add a third tablespoon of cream. At this point, it should look pretty crumbly, but dough should hold together when pinched. Empty crumbly mixture onto a clean surface and gently shape it into a disk. Chill for 2 hours to relax the gluten in the dough. Remove from refrigerator, let sit for 15 minutes, roll into a 12 inch circle and fit into a standard 9 inch deep dish pie plate. Return dough-lined pie dish to the refrigerator and chill while you prepare filling. Topping: Prepare this right after you make the crust. Mix first 5 ingredients in bowl of food processor. Add cut up butter and pulse until crumbly, then sprinkle in the vanilla extract. Cover and store in the refrigerator until ready to use. Filling: Place the rhubarb in a large bowl (here's where an 8 cup measuring cup is handy). Add the sugar, tapioca flour, and zest and stir gently to coat the rhubarb. Transfer the filling to the chilled pie shell. Spread evenly with a slight mound in the center. Sprinkle/crumble the streusel topping evenly over the pie to cover completely. Press it lightly to adhere. Put the pie on the center rack, then set a pan for catching drips on the rack below it. Bake the pie at 400 for 20 minutes. Tent loosely with foil. Lower the oven temperature to 375 degrees and continue baking another 40 to 50 minutes. Cool completely on a wire rack. And here's the apple filling I used. Mix sugars, cinnamon, salt and flour in a large bowl. Put apples on top, toss butter over apples and toss everything to combine, coating the apples with sugar mixture. Toss in the lemon juice. Bake at 400 for 20 minutes, lay a piece of foil loosely over pie to shield, then bake at 375 for about 40 minutes. Make sure to put a rimmed pan on the rack below the pie to catch drips! Thanks, Anna! The pie turned out great. I replaced some of the rhubarb w/ fresh strawberries. With the crust and the 2 1/2 lbs of fruit, I actually had enough for 1 1/2 pies. Crust was nice and the whole combo was just fabulous with some vanilla ice cream. Thanks for the catch! In the cream cheese pie crust, you use 2-4 tablespoons of cream of the liquid. I think water would be fine, though. I’ve edited the recipe. Also, the first 20 minutes are at 400 then you lower the temp and bake it at 375. Let me know how it goes! I’m going to make this tonight. Cream wasn’t in the crust list, but it is in the instructions – I don’t have cream but will sub with water. Probably will be a little less yummy, but oh well! Also, instructions don’t have start temp. Should it start at 400 degrees and then go to 375? And should the foil tent ever come off? Thanks! We all love rhubarb and can’t wait to try this. I don’t freeze rhubarb because we can buy it frozen, but I don’t know why you couldn’t. Does anyone ever freeze and bake with chopped rhubarb? Curious if that would work…thanks! This looks fantastic, rhubarb and apple crumbles have to be my favourite dessert dishes, but I like this new take on the recipe. I would never have thought to use a cream cheese crust. Who’d have thought they were so versatile! Thanks for this, rhubarb lovers should post more often! If you were to ask my chef friend, Paige, http://www.acookinglifeblog.blogspot.com about streusel, she makes a fabulous crisp/crumb topping and always rubs cold butter in with her hands instead of using melted butter. Paige also loves rhubarb and I know she has a number of rhubarb recipes on her blog. I’ve never made crumb topped pie before, or a cream cheese crust. This looks really delicious, and when I’m ready to make pie again, this will be my choice!